Q & A: How do you schedule everything? Last week I talked about some tips for having a jewelry business and opportunities that come from doing craft shows. After that episode I had some questions and I figured more of you might have these same questions, so I would start to answer them here. You can listen to the audio or read below. The first question is basically about fitting everything into your schedule that you have to do to run a business. Basically, I get the sense that a lot of you may be overwhelmed with how much time having your own business seems to take. I’ll be honest, talking about this kind of freaks me out because I honestly don’t know how it all fits in. Some days seem hectic and crazy. Other days flow easily. I do a lot of to do lists and I’m highly motivated by checking things off. Yes, having your own business takes a lot of time. It’s especially difficult to think about if you’ve been working at a job for a while before starting your business because at a job you go in at a certain time and you’re done at a certain time and you don’t have to think about it anymore. That was my experience at least coming from a job into self-employment. Having your own business is nothing at all like working for someone else. If I’m awake, I’m mostly at the very least thinking about the business. For example, I listen to business podcasts even while I’m cooking so that I can learn even when I’m doing other things. The truth is I can answer this question pretty simply, but you’re not going to like it. You have to really come up with your own routine and your own rhythm. Owning your own business means that you get to figure this all out for yourself. You are the boss and you can do whatever you like. I’ll give you some scheduling tips that I have, but really it’s up to you to figure out your priorities, how much time you’re willing to give to your business and how much you’re willing to put into it. I truly believe you can be successful if you’re willing to work hard and put in the effort. And if you’re not willing to do that, you probably should just go ahead and find a day job that you like. I don’t mean for that to be negative at all, but I do know that success does not happen overnight, no matter what it looks like, and that no one is lucky without a lot of hard work. How did you split your time up in a week to a) designing and making, b) the paperwork, c) craft fairs preparation, setup and attendance, d) other marketing, e) photographing and posting items on Etsy/eBay/Website? Also, do you do your own website? I actually do a yearly, quarterly, monthly, weekly and daily schedule. At the beginning of the year I set goals. Then each quarter I do a map for the next quarter. Then from that, I create a list for each month. And then each week work on the monthly list. Every day I create a daily to do list. Daily I chunk my time into segments throughout the day, such as 9-1 work, 1 – 2 lunch break, etc. And I work in 45 minute increments within that usually. I’ll actually set a timer, work 45 minutes and when the timer goes off I stretch and take a 15 minute break. Sometimes my “break” is actually marketing or doing something different business related, though. Sometimes it is going outside because I haven’t been in the sun enough that day. I choose what I’m doing based on priority. I pick the thing that is coming up next in my life/business that I have to get things done for. So that might be a craft show, a store that needs more inventory, shipping something or for me it might be an eCourse that I’m filming video for or tutorial I’m shooting photos for. I usually have an action list for each project so I know exactly what needs to be done and I spend most of my time usually working on that project. So let’s take a craft show for example. You would need to make sure you have enough inventory, make sure everything is tagged, make sure you have all your displays and everything you need ready. I always do a list of the inventory that I want to take to the show, so how many pairs of earrings, etc. I want to take. Then I see what I have on hand to take and make a list of what I want to make. And this is what I’m striving for. Sometimes it happens, sometimes it doesn’t, but I do my best to stick to it. I figure out how I’m going to make all these items. So I’ll have to make so many pairs of earrings a day to have them all done in time. I like to work in production mode when I’m getting ready for a show, so I’ll make all earrings one day and all pendants another, etc. I work out what I need to do each day to reach that goal. I don’t necessarily say Monday is earrings day, Tuesday is pendant day because I hate have a schedule that is that fixed. But I know on those days I’ll be making stuff and I know I’ll work on similar items on each day because I work faster that way. After the craft show is done, then I see what’s next. And of course, the whole time you’ll still need to marketing. More on that in a minute. If you are just starting, most likely you’ll spend most of your time on designing and making jewelry and getting used to your techniques, growing your skills and learning what your style is for your jewelry line. Then I would suggest spending time photographing your items and getting good at that – both photographing and editing photographs. And then looking for craft shows and listing items online. After you have products you of course need to market them, which you can do through social media, blogging and/or a newsletter. And you need to be taking care of bookkeeping the entire time. So to bring this back around to the question, when I know I have something coming up, that takes up the majority of my time. I don’t create specific schedules, but I do create lists and I work in chunks of time. So for me designing and making takes up less time now than when I started. When I started it took up most of my time. Now I have a good supply of jewelry to sell, it doesn’t take as much of my time. When I first started my business paperwork was the worst part. I hated doing bookkeeping and I only did it every 3 months when my sales tax returns were due. Now I have changed the way I think about it and I take care of paperwork every day. Some days I keep track of sales as they come in or I just log it all at the end of the day. This might be shocking, but I actually do all my paperwork by hand because it’s so much easier for me to keep track of and see that way. I like to keep a running total, know where I am toward my monthly goal and know my exact expenses. So not to confuse you, though, there are certain expenses that I only track monthly such as etsy fees or paypal fees. I fill in other expenses as I pay for them. Once I started doing paperwork every single day as opposed to waiting, it got so much less stressful. And once I found a system that worked for me (which for me is paper and pencil) it got a lot simplier. Honestly, this does not eat up a lot of time and if you stay on top of it like I said it’s not as big of a deal and it can actually be fun to watch your sales grow. Plus, you can keep a better handle on things like how many beads you are buying when you keep an eye on it. I talked about craft shows a little bit and I think it’s completely normal to focus a lot of time on craft shows when you have one coming up and then less on them when you don’t have one coming up. When you’re doing your first shows it will take you a lot longer getting ready for craft shows. For me at this point I simply need to make sure I have enough inventory. I already have everything else ready to go. And you’ll get to this point, too. Marketing is another one of those daily activities. I post a lot on my Facebook page and on twitter – a few times throughout the day. I try to Instagram a few times a week. I use pinterest daily. I blog a few times a week. I send out newsletters to 2 different groups each week. I probably spend more time on marketing than anything else, but that’s not necessarily the case when you’re starting out. When you’re first starting out your main focus probably should be designing and making, then photography. I don’t know exactly how much time I spend marketing, but I usually do it in those 15 minute breaks I was talking about before as far as social media goes. My newsletters take some time and of course so does blogging. I also try planning out what my marketing will be each month and even create a loose daily schedule to try to stay focused. At the moment I’m not selling my jewelry online because I’m taking a break, but when I was, this was a significant portion of my weekly routine. If I wasn’t getting ready for a show or getting things together for a store, I was taking photos of jewelry and listing it online. I hope these answers help you in some way. I know it’s probably not the answer you’re looking for, but like I said, it’s your business, so set up your schedule in a way that makes sense to you. Yes, it is time consuming, but it is totally worth it. You will get the hang of things and tasks will get quicker and quicker for you. Okay, and now to transition into a separate question, but I can answer it pretty quickly. Yes, I do my own website. I have a wordpress site, which is pretty common. You can use it for a blog with some static pages, like I do, or you don’t have to have a blog at all. There’s a free version, which is wordpress.com, but it doesn’t have as many features and there’s the paid version, which is wordpress.org. You have to pay for your domain and hosting. I find WordPress easy to use and I like a simple clean design in my website, so that’s easy for me to accomplish. You can of course get more complicated. If I did that, I would hire a designer. But I would still handle the day to days of my website myself. If this is something you’re thinking about doing, there are tons of free resources on the internet about wordpress and I recommend you check them out. I also sell on etsy and craftsy, too. I’ll answer more questions as we go along. I can, of course, answer them from my perspective, but you’ll find as you go along your own rhythm. Certain things get easier as you go along, too and become much less time consuming as well. Let me know if you have any questions. You can email them to me or if you are on the Craft Show Tips newsletter just respond to the email and ask away. 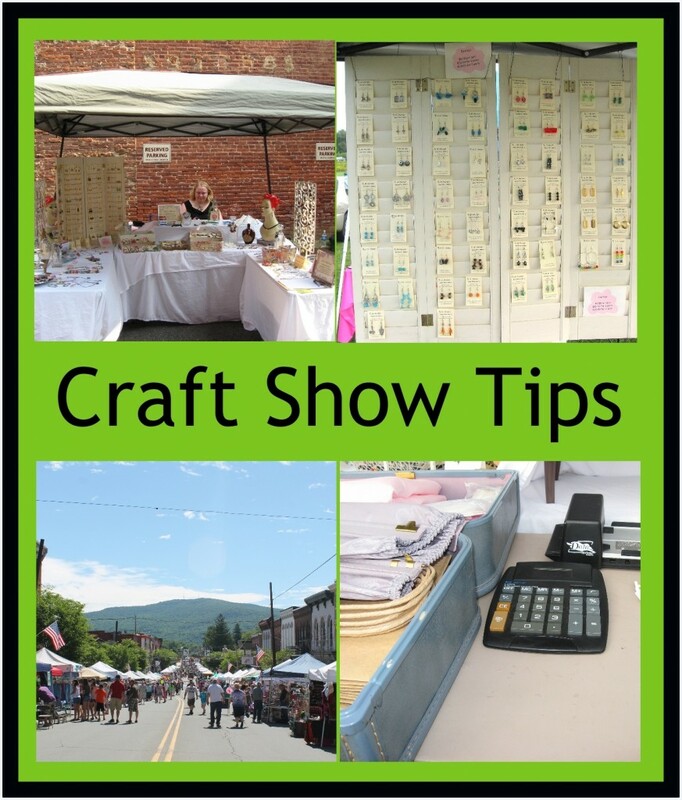 This entry was posted in Business, Craft Show Tips and tagged business tip, craft show tips, crafty business, scheduling by Kimberlie. Bookmark the permalink.